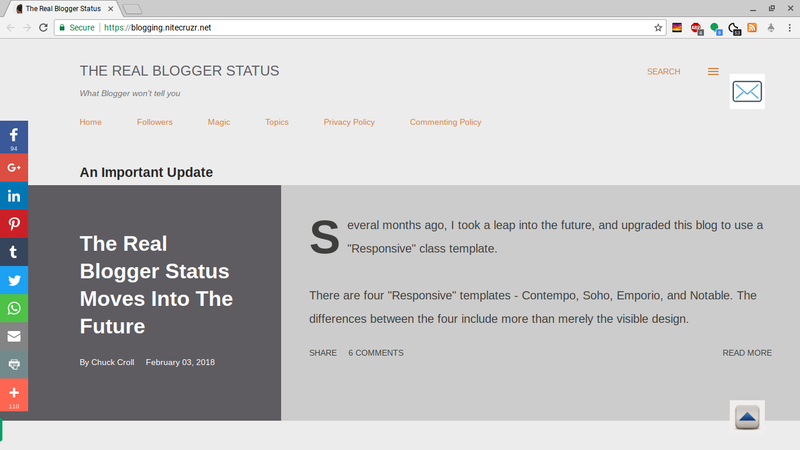 After years of waiting, this blog is now readable, using HTTPS. 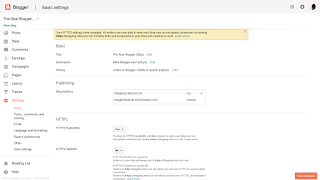 This blog, and others published using properly setup custom domains, now provides optional HTTPS connectivity - joining BlogSpot published blogs. I looked at the Settings - Basic page of my Blogger dashboard, a couple hours ago. Previously, I might see the HTTPS options "Availability" and "Redirect" when accessing my Draft Blogger dashboard. Now, both are there, in Production Blogger. If you publish a blog, using a custom domain URL, you should see the new option too. It took 5 minutes, with my blog, to activate "HTTPS Availability". A couple hours ago, "HTTPS Availability" was offered, on my Blogger dashboard. There are two options - HTTPS Availability, and HTTPS Redirect. 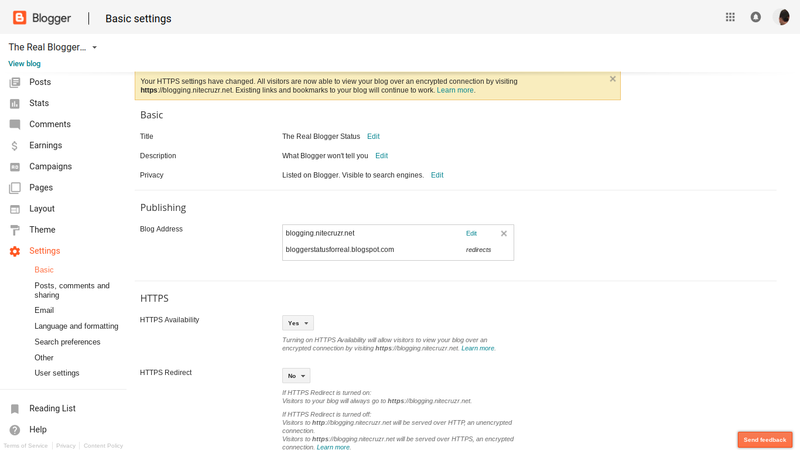 HTTPS Availability lets your readers access your blog, using HTTP or HTTPS, as they choose. 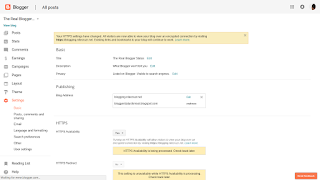 HTTPS Availability is now an option, for all blogs. HTTPS Redirect automatically requires all readers use HTTPS, to access your blog. HTTPS Redirect is an option, with HTTPS Availability enabled. HTTPS Availability is now an option! 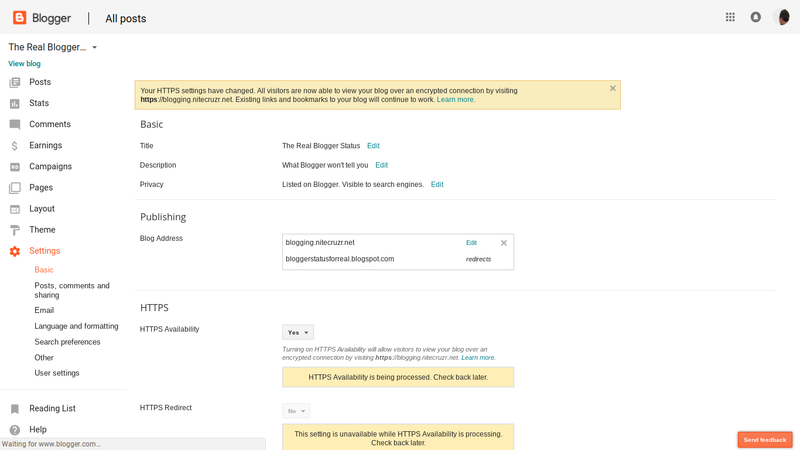 "HTTPS Availability" lets your readers, who use only HTTPS, connect to your blog. It's the first step in upgrading the web. So, it's selected - and now we wait. When you enable "HTTPS Availability" for a custom domain published blog, Google will setup an SSL certificate for the domain - free of charge. Just enable the option, and wait a few seconds - and your domain will be secure, with certificate. Less than 5 minutes later, and I see the display updated. "HTTPS Redirect" is now available, for this blog. "HTTPS Redirect" automatically requires all of your readers to use HTTPS, when reading your blog. It's the second step in upgrading the web. So "HTTPS Availability" is now a reality. Common sense - and Blogger advice - tells me to take things slowly. I'll still allow HTTP connectivity, for readers who can't use HTTPS. I next need to setup Search Console entries for this blog, using HTTPS. For best results, the domain needs to be properly setup. Both the BlogSpot to domain redirection, and the domain root ("naked domain") to published URL redirection, can be complicated, with HTTPS offered for an improperly setup domain. Also, remove any other custom installed redirecting code. Both code blocking local country redirection, and code blocking (or enabling) HTTPS redirection, will interfere with the HTTPS Redirect option. And check your non Blogger accessories and features carefully. 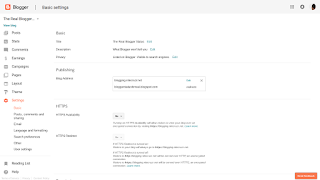 Blogger is not the last Internet service to provide this upgrade - and your blog will provide the best experience, for your readers, if all accessories and features also support HTTPS. Test the blog and domain, in the many URLs. 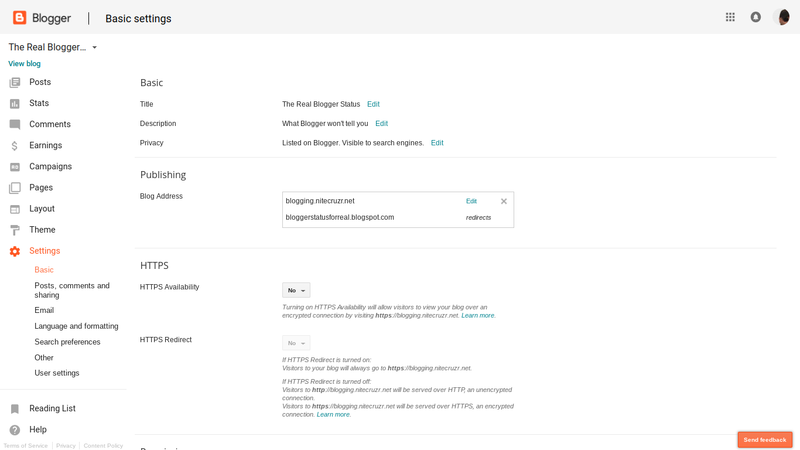 With the blog published to the domain, and offering HTTPS connectivity, you'll have 6 URLs - all pointing to the blog. Make sure that all 6 work properly. 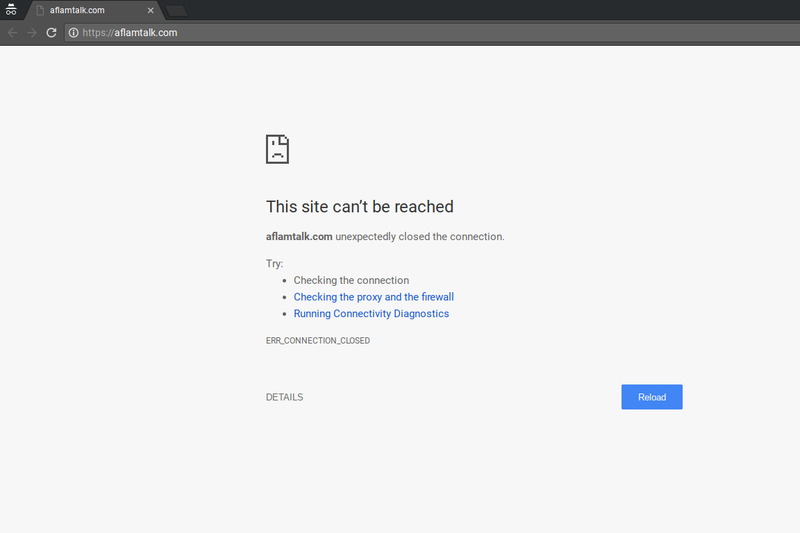 Right now, my test blog does provide HTTPS connectivity / redirect - and similarly, this blog now does. Using my test blog, I have 6 URLs to check. Note that this blog is published as "blogging.nitecruzr.net" - not "techdict.nitecruzr.net", or "www.nitecruzr.net". Your readers will be happiest, if all 6 URLs work - and all redirect to your blog. Again, your domain will probably use "www", in place of "blogging" or "techdict", in #3 and #6. Be prepared to re publish the blog, for best results. If you were using "HTTPS Redirect" for the BlogSpot URL, #2 and / or #5 many be "404". You may need to re publish the blog, and remove the BlogSpot "HTTP" to "HTTPS" redirect. The domain root redirect, and "HTTPS Redirect" for the domain, may conflict. Activate "HTTPS Redirect" for the domain, with the BlogSpot URL having "HTTPS Redirect" enabled - and you may see this. You will have 3 redirects, with HTTPS Redirect enabled. 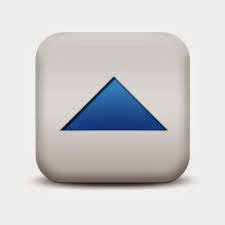 The BlogSpot to domain redirect. The domain root to published URL redirect. The "HTTP" to "HTTPS" redirect. All 3 redirects need to be added in proper sequence - if you want the BlogSpot URLs, the domain root, and the published domain URL to all redirect to the blog. 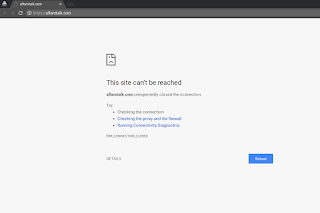 With both the BlogSpot redirect, the domain root redirect, and the HTTPS redirect enabled, you may see an error when addressing the domain root. In that case, you'll have to re publish the blog to the domain. Login to production Blogger ("www.blogger.com"). Publish the blog back to BlogSpot, by clicking on the "X". Re publish the blog to the "www" domain host. Select the domain root redirect. With both HTTPS options enabled, your blog will have up to 7 URLs. Given 2 of the 3 URL redirects, your BlogSpot published blog will have 4 different URLs - of which only 3 should be operational. Similarly, your custom domain published blog will have 8 different URLs - of which only 7 should be operational. Different settings for "HTTPS Availability" and "HTTPS Redirect" will produce a different final URL - and temporarily reduced search reputation and search related traffic. To add to the complexity, I'll point out that "www.myblog.blogspot.com --> myblog.blogspot.com", yet "mydomain.com --> www.mydomain.com". Be careful when editing the pages / posts / template. One of the reasons why HTTPS took so long to be available with Blogger - and contrarily, why the entire web did not upgrade over night - is that other blogs and websites have not yet upgraded. If your blog is to provide useful HTTPS connectivity, any accessories and features, that you depend on, must also offer HTTPS connectivity. If a non HTTPS link is present, your readers will see scary advice about "mixed content", and "unsafe" web pages. Blogger provides "mixed content" warnings, in page / post / template editor, when appropriate - but read their warning very very carefully. Before you change a link from HTTP to HTTPS, you have to verify that the accessory linked will provide HTTPS connectivity. The "Fix" option in the page / post / template editor "mixed content" warning will break accessories that don't yet provide HTTPS connectivity. Don't change links from HTTP to HTTPS, without verifying that they will support the change. Understand the details, to ensure an effective migration. If you can deal with the details, you'll have a secure domain - and you can now offer your readers SSL connectivity, to your custom domain published blog, using all 6 links above. 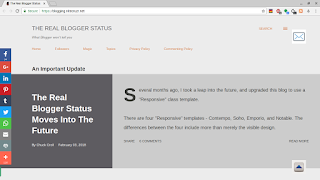 HTTPS Availability is now an option for all #Blogger blogs. I'll continue to offer HTTP, for readers who can't use HTTPS - but those who require HTTPS can now use it, to access this blog - and other custom domain published blogs. Yes and YAY forthe HTTPS - which my blog now uses. Oh Happy Day!